The first comprehensive, single-volume book to compile all the most important data on rubber-clay nanocomposites in one place, Rubber-Clay Nanocomposites: Science, Technology, and Applications reviews rubber-clay nanocomposites in an easy-to-reference format designed for R&D professionals. Including contributions from experts from North America, Europe, and Asia, the book explores the properties of compounds with rubber-clay nanocomposites, including their rheology, curing kinetics, mechanical properties, and many others. Rubber-clay nanocomposites are of growing interest to the scientific and technological community, and have been shown to improve rubber compound reinforcement and impermeability. These natural mineral fillers are of potential interest for large-scale applications and are already making an impact in several major fields. Packed with valuable information about the synthesis, processing, and mechanics of these reinforced rubbers, the book covers assorted rubber-clay nanocomposites applications, such as in automotive tires and as polymer fillers. 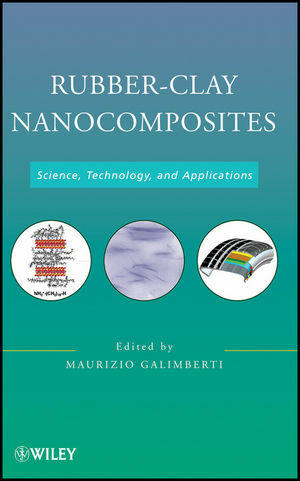 Promoting common knowledge and interpretation of the most important aspects of rubber-clay nanocomposites, and clarifying the main results achieved in the field of rubbers and crosslinked rubbers—something not covered in other books in the field—Rubber-Clay Nanocomposites helps scientists understand morphology, vulcanization, permeability, processing methods, and characterization factors quickly and easily. Maurizio Galimberti is a Professor of Chemistry for Rubber and Composite Materials Technology at Milan Polytechnic, Milan, Italy, and a Visiting Professor at University of Insubria, Como, Italy. He is the former president and a current board member of the Italian Association of Macromolecules; has published over seventy scientific works in international books and journals; and is the author of more than forty patents.